Audi has the luxury utility vehicle market sewn up. The German automaker offers three distinct model lines — Q3, Q5 and Q7 — along with the Allroad and the very wagon-like A3 Sportback e-tron, a plug-in hybrid electric vehicle with a very sensible price. What is missing from the Audi range, at least thus far in the 2016 model year, is its line of turbo-diesel engines. Audi is the major luxury marque for the Volkswagen Group and it is VW that admitted in September to fabricating its emissions testing to circumvent the EPA’s pollution guidelines. As a result, Audi’s 2.0-liter TDI engine is not available in any model. At least not until the automaker presents a fix that is acceptable to the EPA. That leaves just one engine choice in some models, including in the 2016 Audi Q3 2.0T Quattro, a recent weekly visitor and part of my ever changing test fleet. 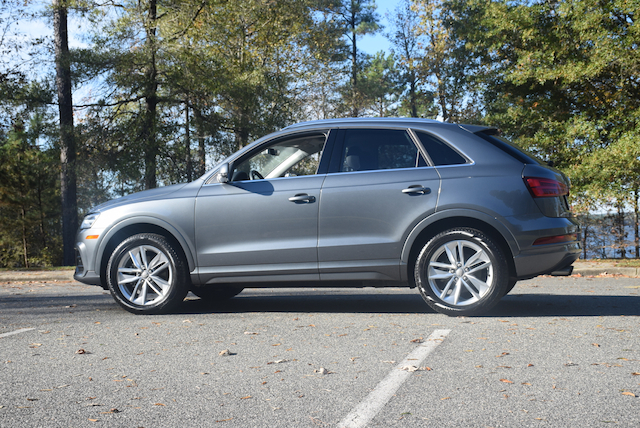 The Q3 is a compact SUV, with the Q5 serving as the midsize model and the Q7 as the full-size SUV. I’ve driven all three vehicles, including a previous Q3 TDI and have always been fascinated by Audi’s styling, build quality and its performance. 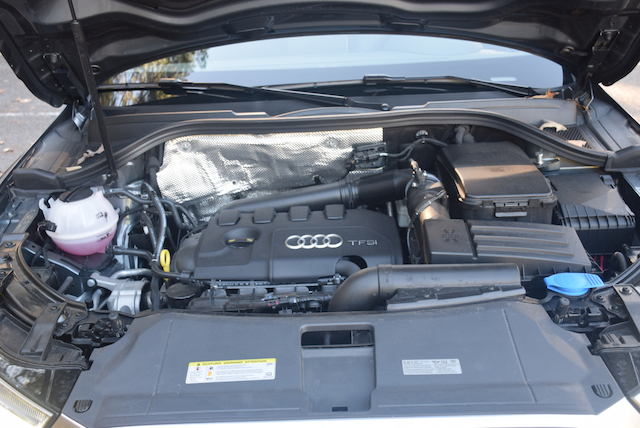 Despite not having a diesel under the hood this time, I was impressed by the gas-powered Audi Q3. More about that later, but first let’s take a look at its styling and interior attributes. Like its larger siblings, the Audi Q3 is marked by a distinct fascia with a large trapezoidal grille featuring the expected four-ring Audi logo. Wraparound headlights and LED daytime running lights as well as large pockets housing the available fog lamps are also present. Deep creases run along the hood and are repeated along this model’s profile. Body sculpting, an even belt line, aluminum wheels, and rocker panel embellishments are also present. To the rear, this model is equipped with a liftgate spoiler, upper and lower combination lamps, and dual-tipped exhaust pipes. Inside, the Audi Q3 provides room for five. Its compact interior, however, doesn’t skimp on comfort: the front bucket seats provide 12-way power adjustment with lumbar support. The 60-40 split folding rear seat includes a center pass through — a welcome feature when you need to tote something long, such as skis, and you don’t want to miss more than one seating position. 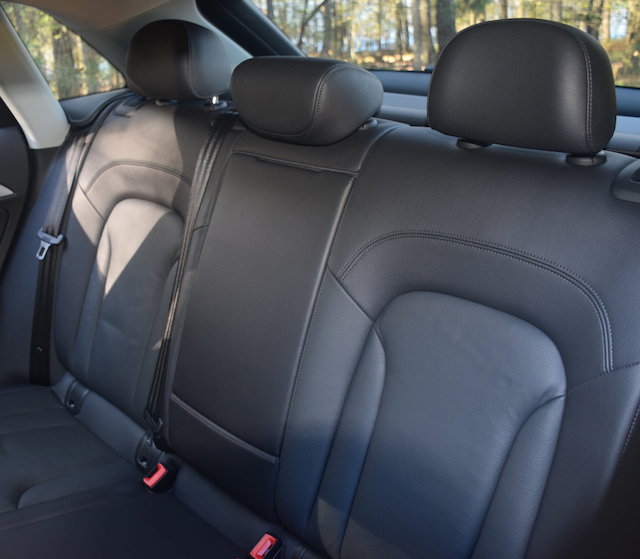 And even if a seating position is absent, the rear seat is best enjoyed by two adults — hip and shoulder room are crowded back there. 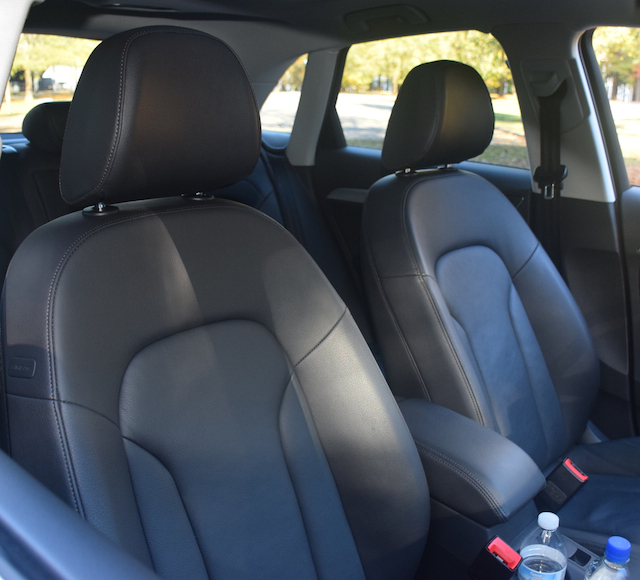 Further, if you are considering a model of the Q3’s stature and have teenagers, the Audi Q5 may be the superior choice here — rear leg room is tight in the Q3 for anyone remotely close to adult size. Audi presents interior layouts that are refined, uncomplicated and comfortable. In the Q3 you’ll find leather nearly everywhere with aluminum trim providing rich accents across the dashboard around the center console and on to the door inlays. The instrument panel features a two-analog dial display — tachometer and speedometer — with a digital driver’s information center in the middle. The information center is controlled by switches found on the face of the steering wheel. On the dashboard just above the center stack is a stand up screen with a multi media interface (MMI). The MMI arrangement is fairly straightforward — the sharp screen makes everything easy to understand. You can also access secondary hardware switches if preferred — and that’s a fine feature when the touchscreen gesture control doesn’t work out for you. The one big drawback of this system is that there is no USB port included — you must connect your phone to one of the supplied cables, provided that cable is right for your phone. Below the display screen in the center stack are large vents, followed by audio system and climate control switches and knobs. Dual-zone climate control and heated front seats are standard. All models come equipped with a 10-speaker Bose audio system, SiriusXM satellite radio, and a rear view camera. Audi prices the Q3 from $33,700 for its Premium Plus edition and $38,600 for the Prestige model. The base model is front-wheel drive; the Prestige is all-wheel drive. Most customers will likely opt for all-wheel drive as it is the preferred handling option of the two. All models come equipped with a panoramic sunroof, eight beverage holders (including in-door drink holders in each door), 12-volt power outlets, ambient LED lighting, and a rear view camera. Choose the Prestige model and you have the navigation system, Audi side assist safety, a 14-speaker Bose audio system and the S Line appearance package. For $40,300, the all-wheel drive test model added a rich monsoon gray metallic finish ($575) and a power liftgate ($400) to the option list. That’s an attainable price point for anyone aspiring to own an Audi with its famed quattro system included. You attain all of 200 horses to move the Q3 as you make your way down the road. It is a turbocharged system, designed to minimize lag while offering optimum power. The suspension system is composed of MacPherson struts up front and a multi-link layout for the rear — both are attached to the SUV’s body by subframes. A rigid body structure aids in mitigating body roll and this SUV’s agility is apparent when making normal turns as well as handling the twisty roads that always reveal the true capabilities of such models. Its higher ground clearance is not much of a negative attribute — I found the Q3 remains composed under a variety of driving conditions. Opt for the sport package ($550) and your Q3 brings in Audi drive select, a leather-covered multifunction sports steering wheel with paddle shifters, and front bucket seats. Audi drive select is managed by a button — when activating the system it controls the shift points and throttle mapping. Yes, you can enjoy a more robust driving experience even with an SUV. Diesel absence notwithstanding, the gas-powered Audi Q3 should deliver everything shoppers in this segment want. The Q3’s chief competitors are a formidable lot and include the Cadillac SRX, BMW X1, Lexus NX, Land Rover Range Rover Evoque, Mercedes-Benz GLA-Class, and the Lincoln MKC. Like the Audi, each model seats five, but four is always the better choice.